Today we have 2 videos that we are categorizing as brands that you need to learn a lot more about. Over the course of the next 12 months, THP should help provide that education in these 2 unique companies. But both of these videos are from companies that we believe are on their way up in the world of golf equipment. Stay Tuned for the rest of the week as we continue to bring you the very best in PGA Show Coverage only available from The Hackers Paradise. As always do not forget to check out the most renowned PGA Merchandise Show coverage anywhere on the planet in our forum. We have an entire section dedicated to just the PGA Show and you will not want to miss a single thread. Well, I’ve been trying to figure out what the hell I should do with that extra $50K and I think I’ve found the solution…. 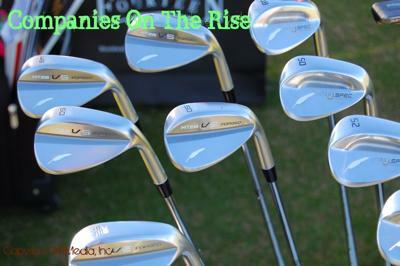 the clubs are cool looking but Josh I cannot believe you did not capture on video the ladies working at the booth! Thanks THP for the videos. I have to say Fourteen Golf has peeked my interest from the first set of pictures you posted from the show. Very clean, subtle lines, very nice looking in deed. Can’t wait to hear how they perform. Williams Golf is of course above my personal means, however I’m sure there is a market out there for people who expect the best and don’t mind paying for it. In fact, I’m sending a link of this video to a person I know who may actually be interested. Thanks again for the great Show coverage. I wasn’t as impressed as you with the Williams clubs. Pretty to look at – but nothing really revolutionary – especially to back up their prices. Fourteen had a lot of performance – especially those hybrids ! Again, can’t see them making big strides in the market when they’re asking that much money for their equipment. I actually think people are overlooking the fact that the regular Williams consumer driver is being priced at $499. There are a few OEMs at that price right now. The technology in it could be quite game changing. We wont know for sure until we test them of course and we should be in the next couple of months. The $499 driver that is, not the $50k clubs.